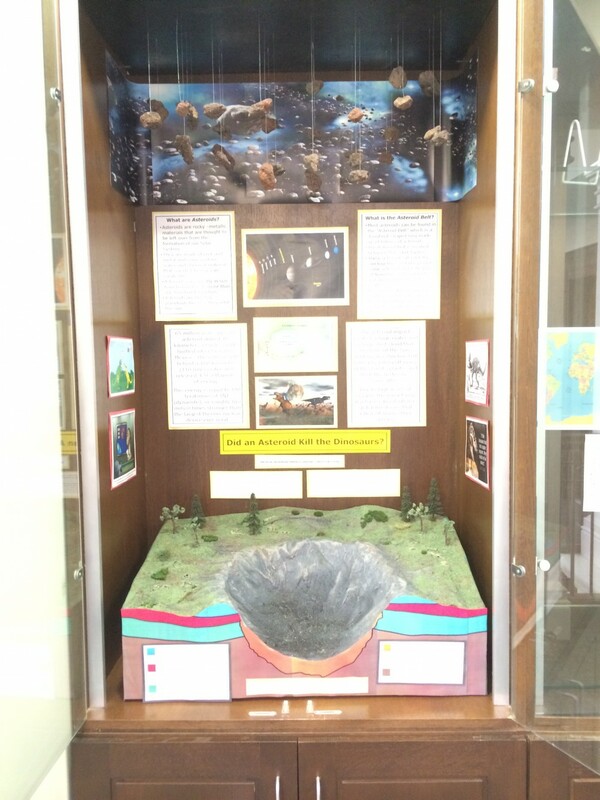 If you go to the Brockton, MA central library anytime this summer (2016) you’ll see a really cool display on meteors and fossils – and how asteroids may have been the reason why dinosaurs went extinct around 65 m.y.a..
As you can see, it’s not exactly museum quality, but it is not too far away! 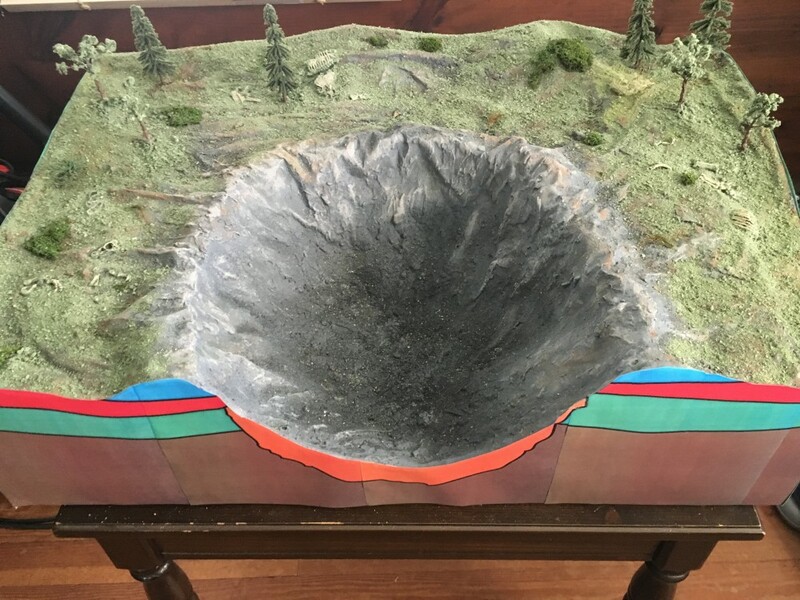 It shows a cross section of an asteroid impact, along with information about the geology of impact craters, as well as info on localized vs mass extinctions (with some plastic dinosaur bones embedded in the diorama). 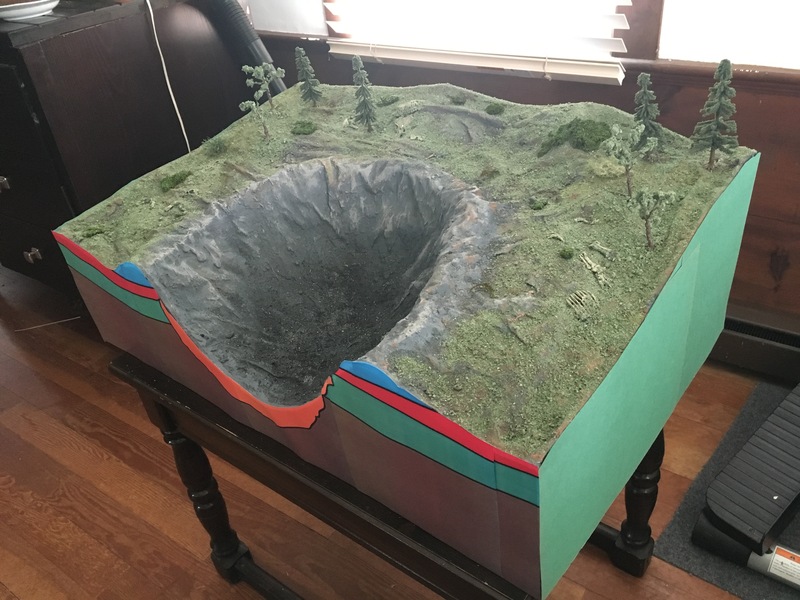 Here we’re going to show you how you can make a similar diorama, using materials you probably already have around your house or can scrounge from friends or otherwise source fairly easily. You can use it for a science project, or for a display at your local library/rec center/community center, or just for a fun project to display at home! 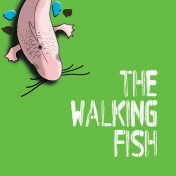 - Optional items: spanish moss, sphagnum moss (both of these you can probably find outside in the yard or at a park), wood sawdust (of different sizes), screen for filtering (or a used garlic bulb net container or similar item to act like a screen), poster board/construction paper for the sides. 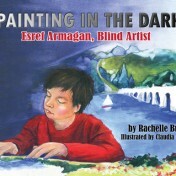 - You may need access to a nice color printer to do labels and legends. 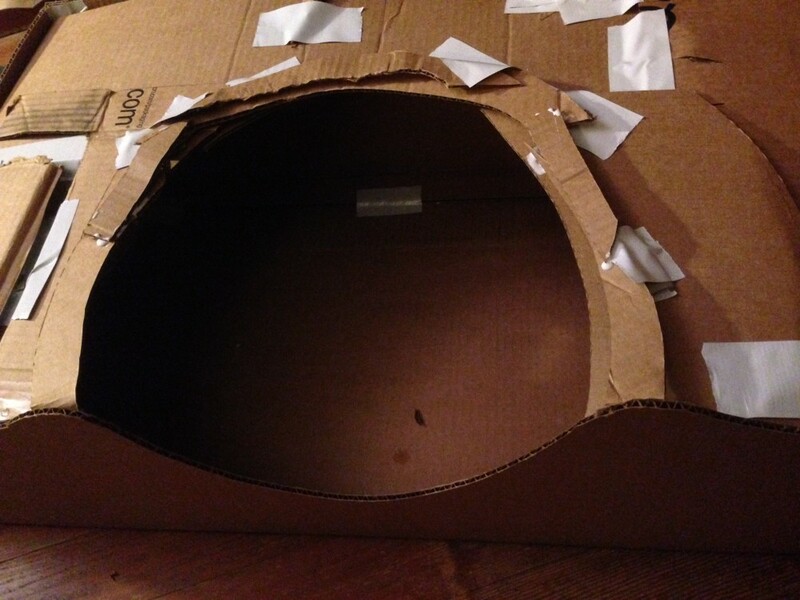 First you’ll need to figure out the dimensions of your diorama. 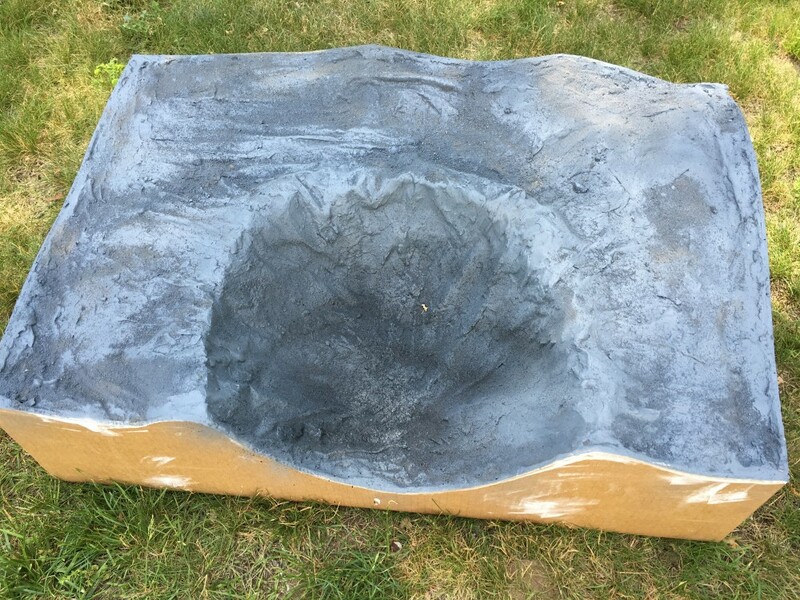 The one shown here is 30″ wide x 19″ deep x 9-12″ tall (taller in the back than the front). 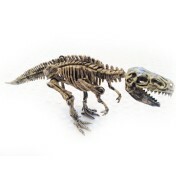 This is generally a good scale for the dino bones I used (about 5-6″ long dinosaur bone kits representing dinosaurs that were roughly anywhere from 8-20 feet long in reality). 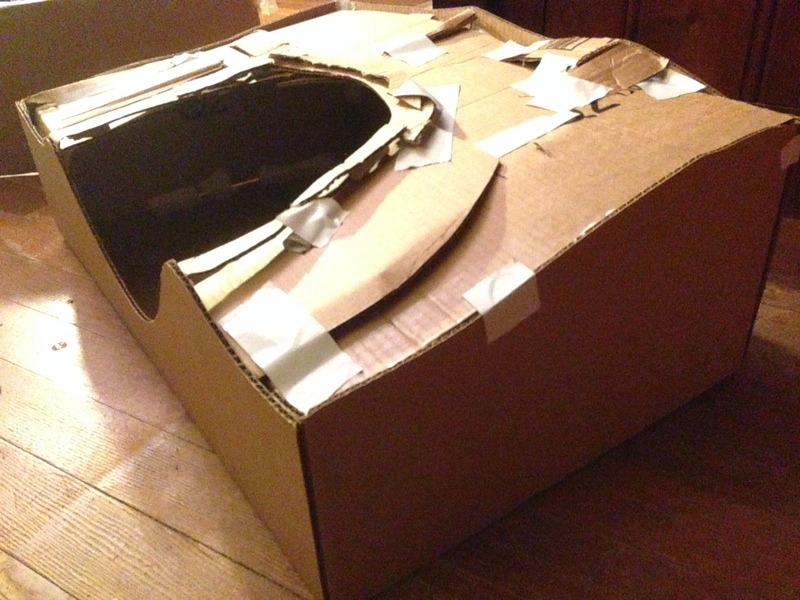 I couldn’t find a box that was already this dimension, so I created one by cutting the sides from an old moving box using a box cutter, and duct taping & gluing it together at the edges. I made sure to create some height variation for little hills on the side and back too. 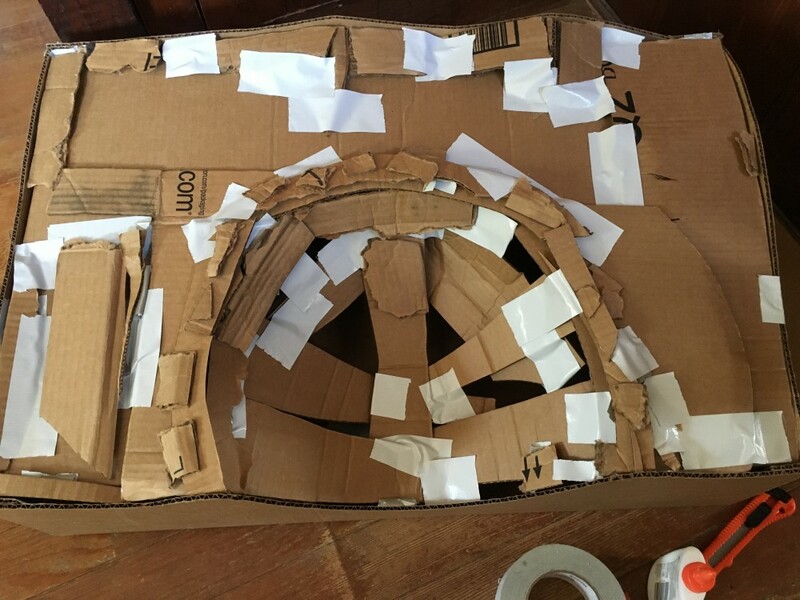 Then, I created a big hole for the asteroid in the middle/front, using supporting struts made out of scrap cardboard strips that I glued and duct-taped to the edge. There’s really no perfect pattern for this – just do whatever looks nice. I also created a rim out of cardboard, and some height variation with extra pieces of cardboard in various parts of the diorama. 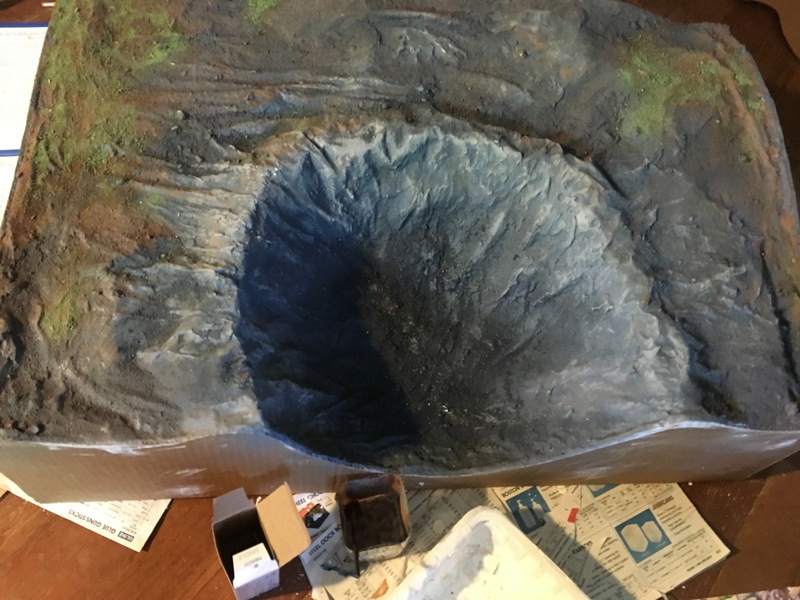 It’s important to try and get the cardboard to go all the way to the edge of the diorama, so it matches up nicely and the edges look clean without too much extra cardboard sticking out. 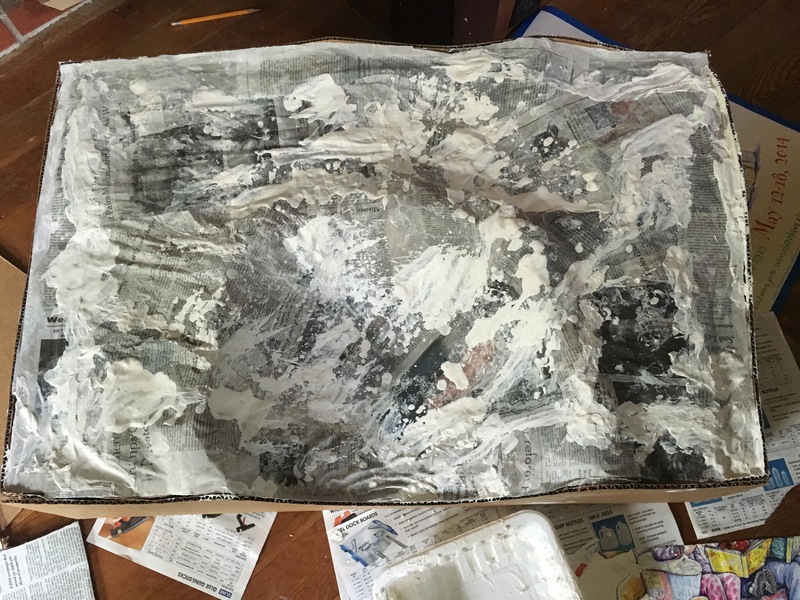 I then mixed a very light (watery) mix of plaster of paris, along with some old newspaper strips and used them like paper mache, and covered the whole cardboard surface, to make it seem like a semi-rocky land surface, imagining a scale of maybe a hundred to a few hundred feet wide segment of land representing the 30″ diorama width. 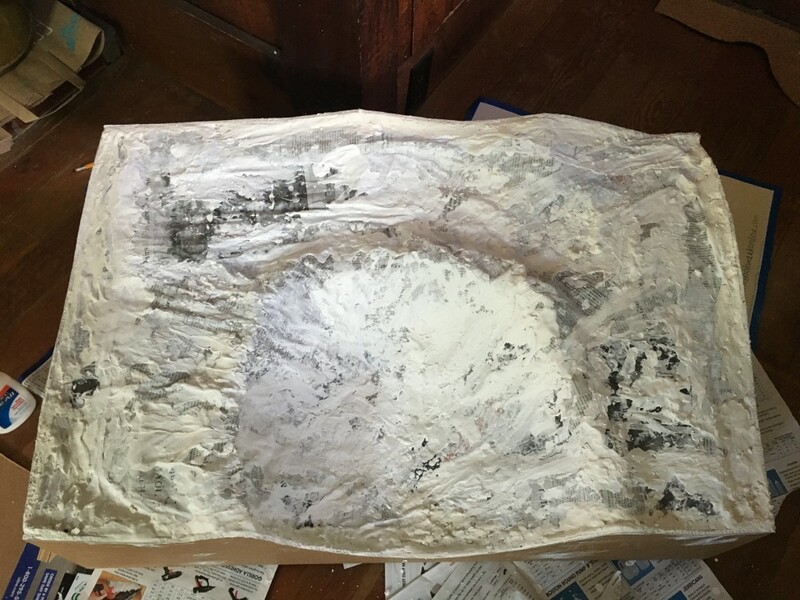 Then, wait part of a day or so… Then add more plaster to make the surface even more rocky, and to cover all of the connecting edges between the pieces of newspaper. Then, I spray paint the entire surface with multiple layers of grey primer paint (I did this outdoors, making sure to spray at least a few inches away – be sure to have a parent help out here), and spread a bit of dry sand into the wet paint to obscure some more of the newspaper edges a bit (and paint over it again, so the sand will stick and show a bit of texture in places). 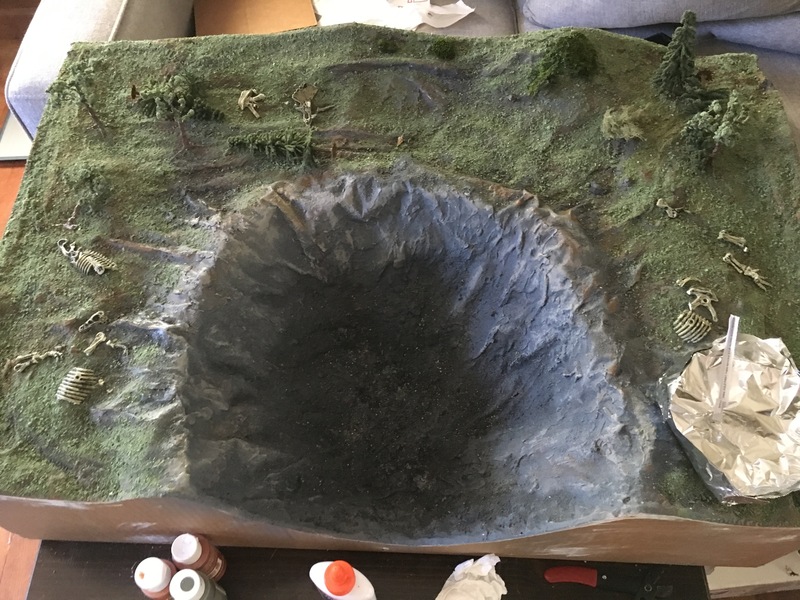 Then, a bit of black spraypaint in the center of the asteroid crater, for dramatic effect. 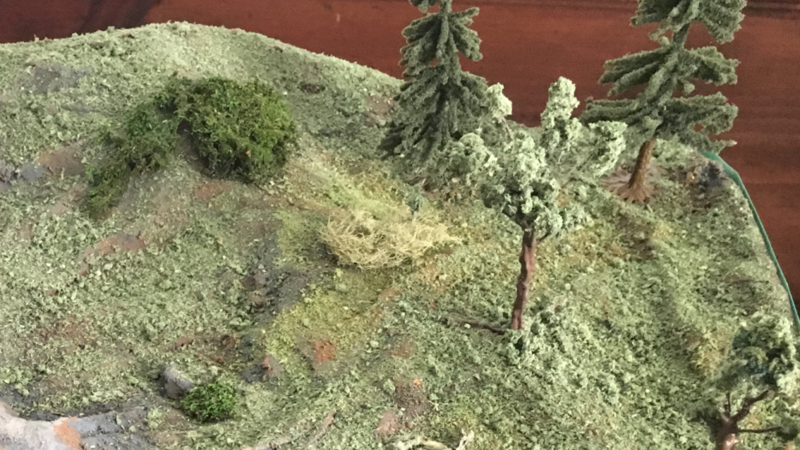 Here you see some artificial grass, which is often used by model railroad hobbyists. I made this using some sawdust from different machines I have. Some finer sawdust from a scroll saw, mixed with some from a drill and grinder. Then some coarse sawdust from a table saw. I separated them into different old plastic containers (you can use old Coke bottles, cut in half), and covered them with a bit of water and a few drops of pine green acrylic paint. 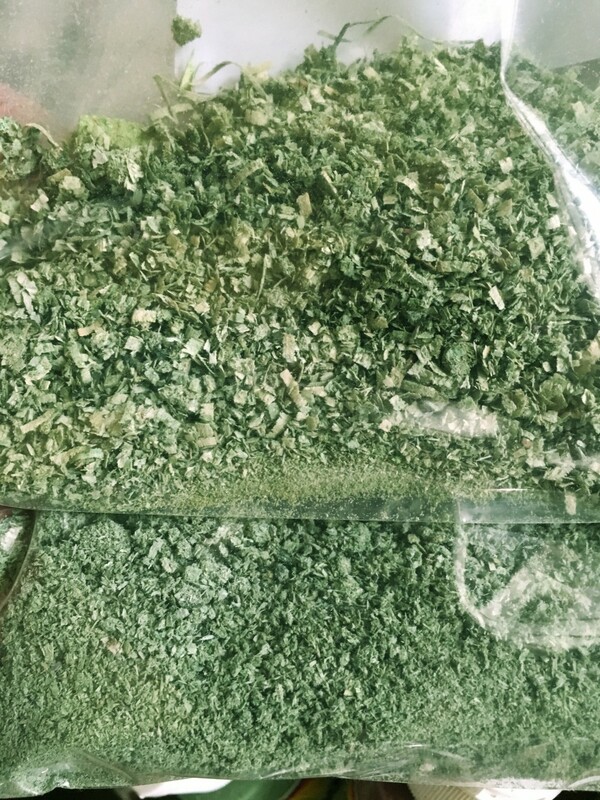 If you let this dry in the sun a few days, the sawdust will become dry again, and green, just like miniature grass/plants. Some people use green spraypaint, and paint them in a plastic bag, but I think this is just messy and expensive – although it’s very fast (10 min drying instead of 2 days). 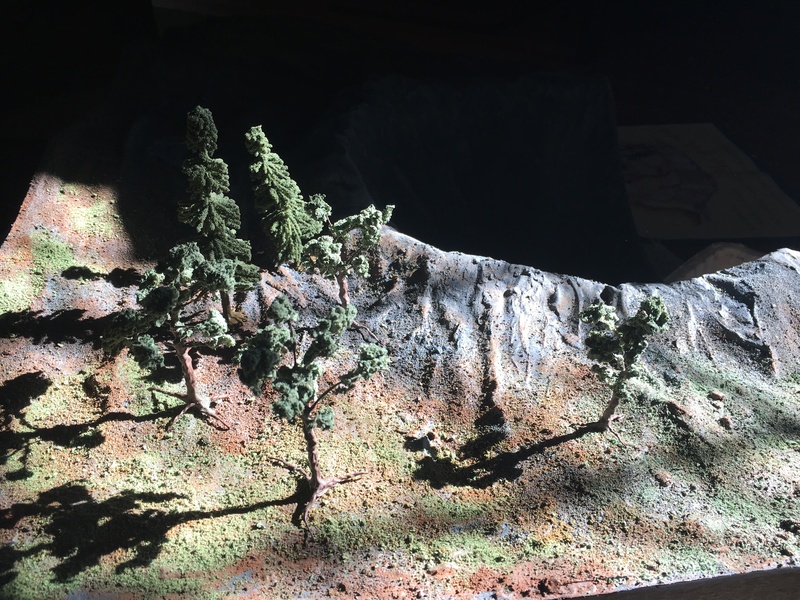 Here the diorama has been painted with some accents – some greys/browns and some artificial grass has been added by sprinkling over areas, which have been covered with watered-down wood glue using a small disposable paintbrush. Around the crater, I added a lighter shade of grey (with a very dry brush stroke on raised surfaces) to make it look more like rocks, and browns in various spots to look like rust staining (and added some grass and/or sand on top of each layer of fresh paint). Then, you can use some old hairspray to fix the whole thing in place. These are some electric wire trees. 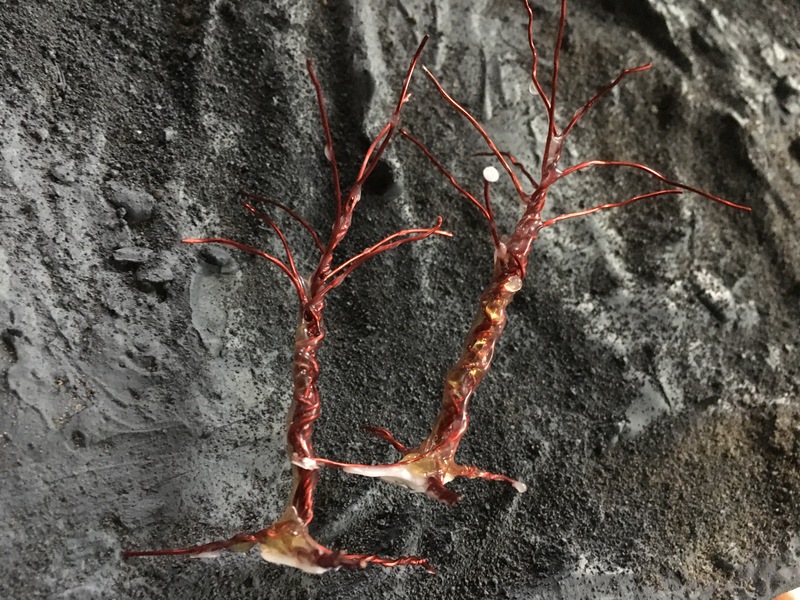 They are basically made by winding a bunch (no less than 9 or 10) of small gauge wires together and then creating roots and branches from them. 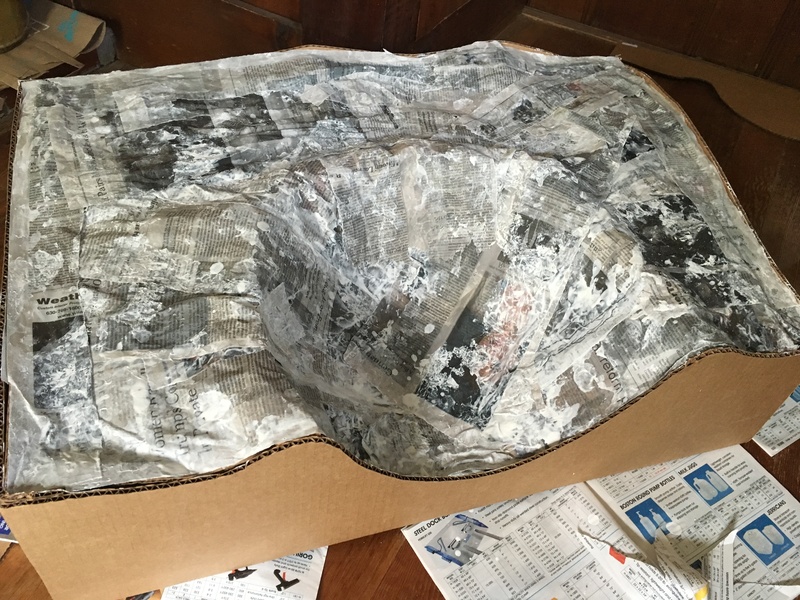 After doing this, you can coat the trunk and branches in various layers of epoxy or regular glue until they become smooth, and then a few coats of brown acrylic paint. Then, put some glue on the tips and run them through coarse artificial grass a few times, and then after drying, add more glue and run them through the finer grass. 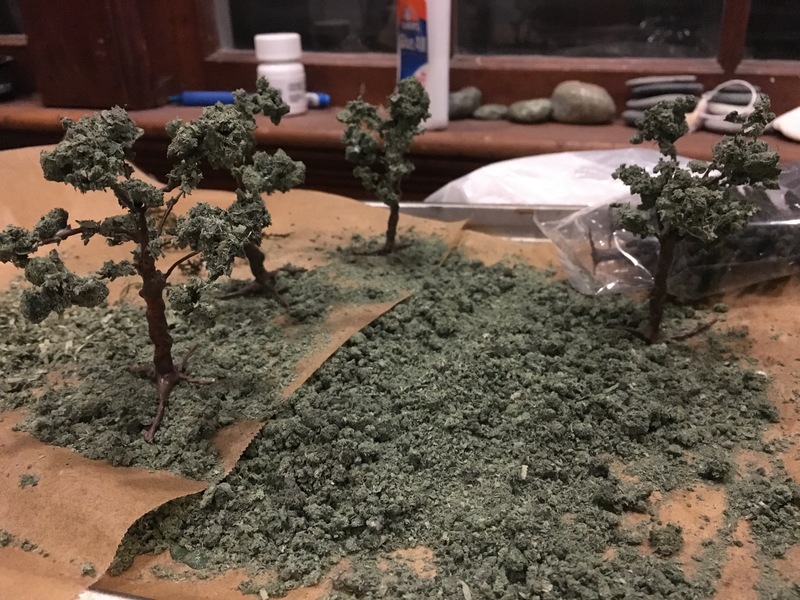 After a few layers, you can see they appear to look like typical deciduous trees. I went back and did some touchup paintwork at this point, as well as adding more glued grass along with some hairspray. You can see it does wonders for the landscape (lighting also makes a big difference during the display too, as you can see). I also added some 50% off model railroad trees from Michaels too (AC Moore also has these, and they both have lots of regular online big discount coupons). 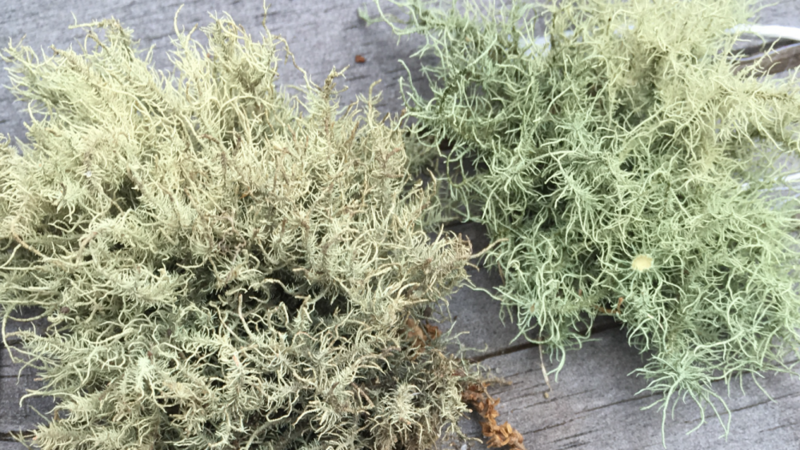 You can also add moss, which you can get from pretty much anywhere outdoors (at least in the Northern part of the U.S.) – both sphagnum and Spanish (tree) moss, to give different texures. 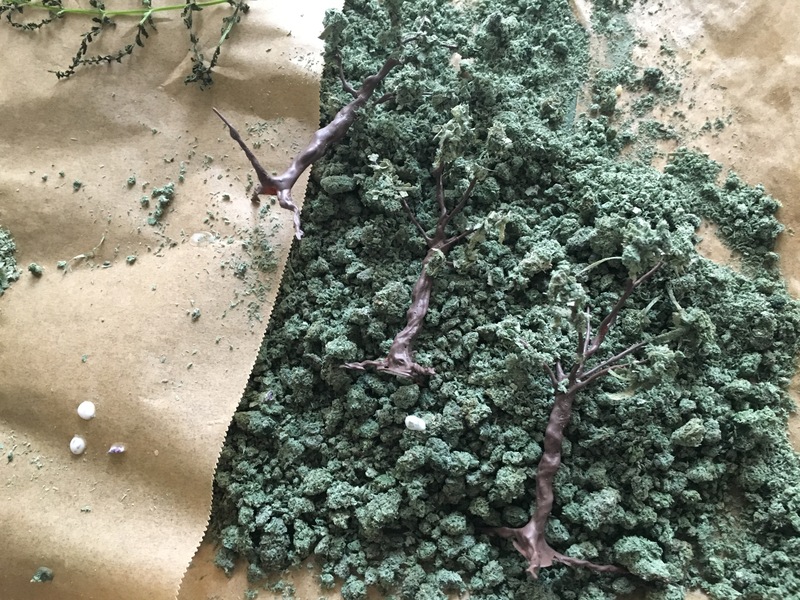 Or you can use any other type of plant that looks like a miniature bush or shrub when dried. You may need to hit these with some hairspray as well (or Matte Finish Spray Varnish) to prevent them from becoming too brittle and breaking apart. 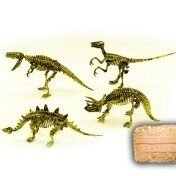 At this point, you should glue your trees in place with epoxy or Gorilla glue, and also add a few dinosaur bones. 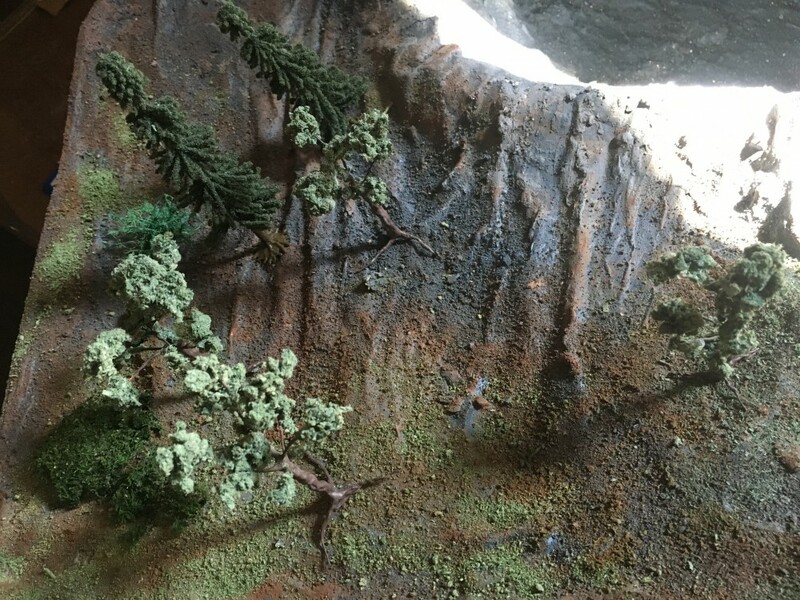 Make sure to cover your tree roots and dinosaur bones with a bit of fine grain artificial grass, to make sure it blends in to your post-asteroid landscape. 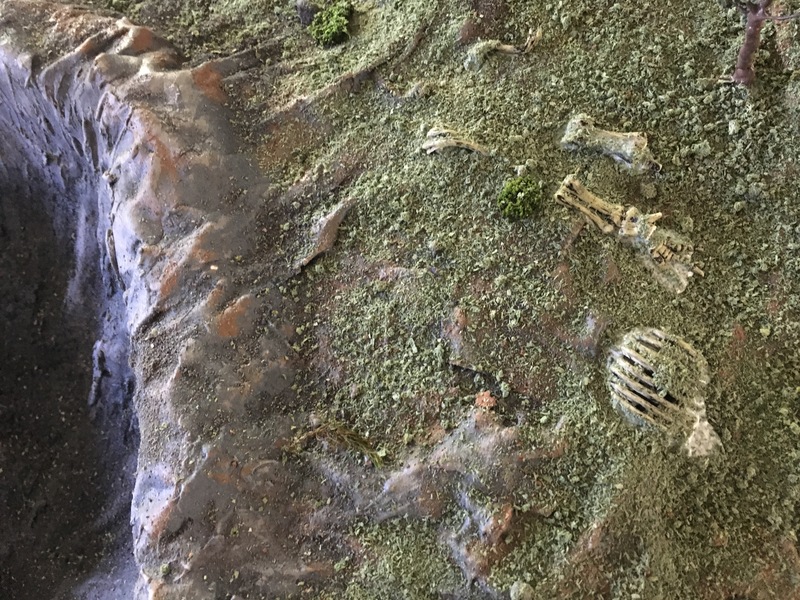 If you need some awesome dinosaur bones for this project, you can try out our THL 4-pack dino excavation kits, and once you’re done playing with them, you can break the bones apart and add them to your diorama – so you can educate others! Here are a few more pics of the finished product. 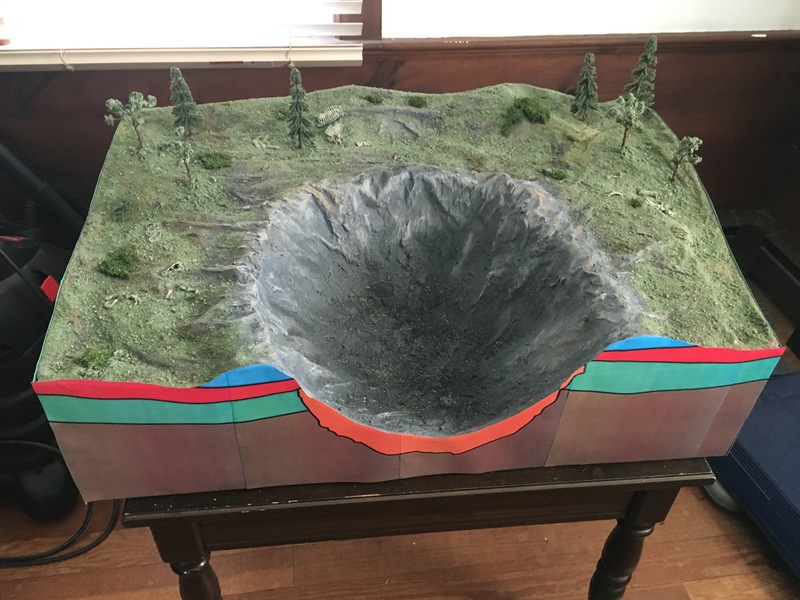 Note that you should research the geology of impact craters on your own, and also note that this does not represent an extinction level event. 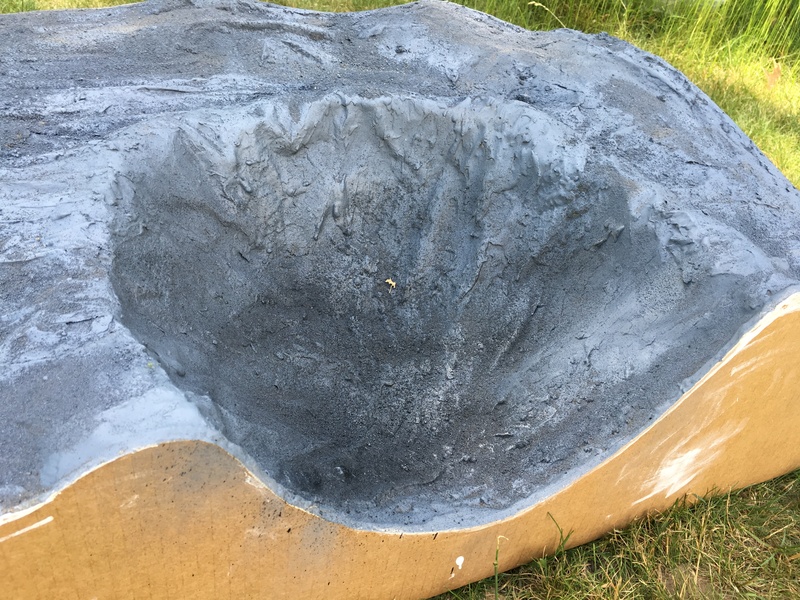 This crater is too small, and while it may have wiped out a local community of dinosaurs, it did not cause global extinction. 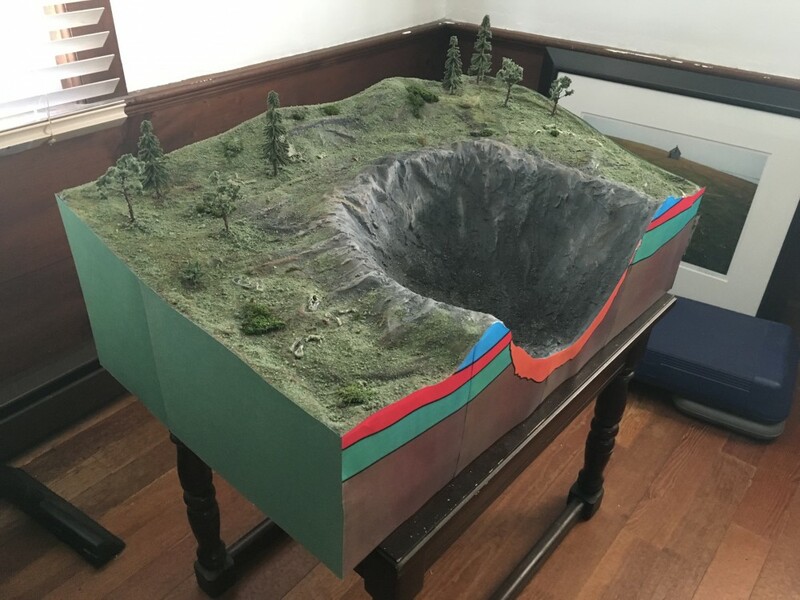 But certainly you should describe the difference in scale between a small crater like this and a major crater like the one that geologists have found in the Yucatan peninsula (Mexico) around the time of the end of the Mesozoic. 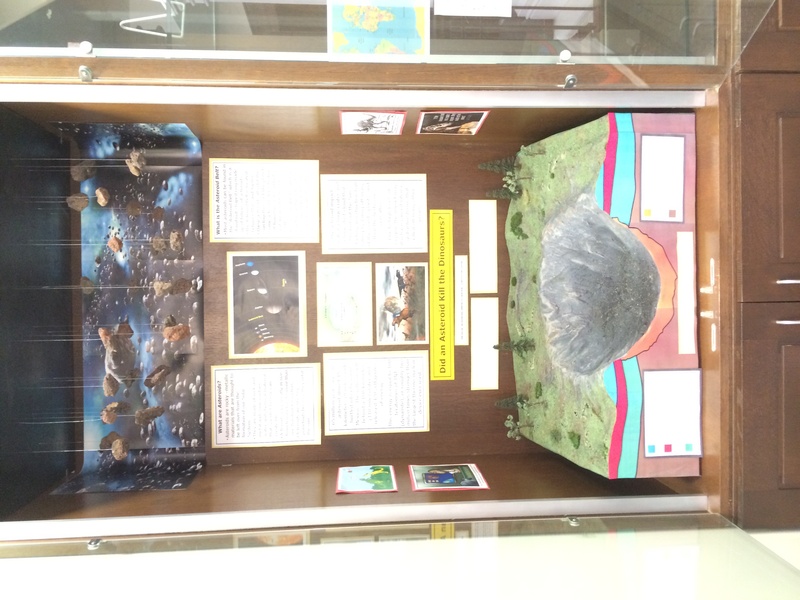 Showing plant materials here in this diorama demonstrates that simpler life forms like plants/vegetation can come back quickly even after a small regional asteroid hit (even if the local community of dinosaurs did not return). Please determine your own scale and do your own research on a local ecology you’d like to emulate and design your educational materials accordingly. As always, please let us know via the contact form above if you have any questions. 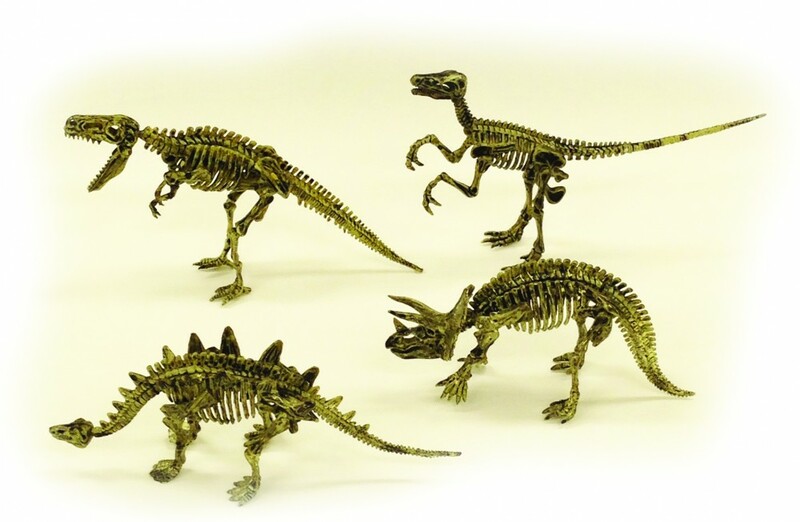 Check out the awesome dino fossils used for this diorama in THL’s Dino 4-Pack Kits!